The month of December brings with it great deals! But did you know that you can save even MORE? 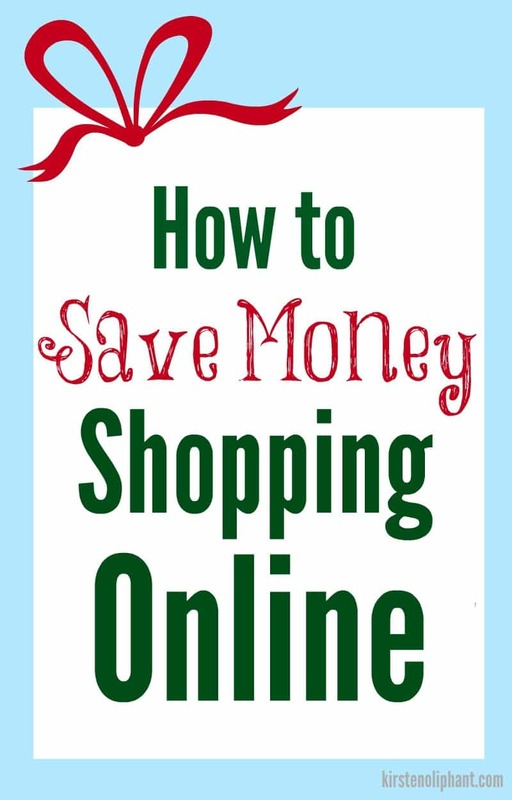 Here are a few tips on how to save money shopping the holiday season and year round! Before I dig in, though, a few things to keep in mind as you shop. 1. Don’t spend more than you have. Just…don’t. You do NOT want to start the new year in debt. No matter what your kids want or the other kids have or what your family thinks is the best way to do gifts, find a budget that is realistic and stick to it, no matter what. 3. Give. Just give. Maybe you can’t keep up with the neighbors or neighborhood. But most of us have more than we NEED and can afford to give of our time, our pantry, or our checkbooks. When you’re working on the holiday budget, plug in some giving. Involve your kids if you have them to help model generosity to your children. 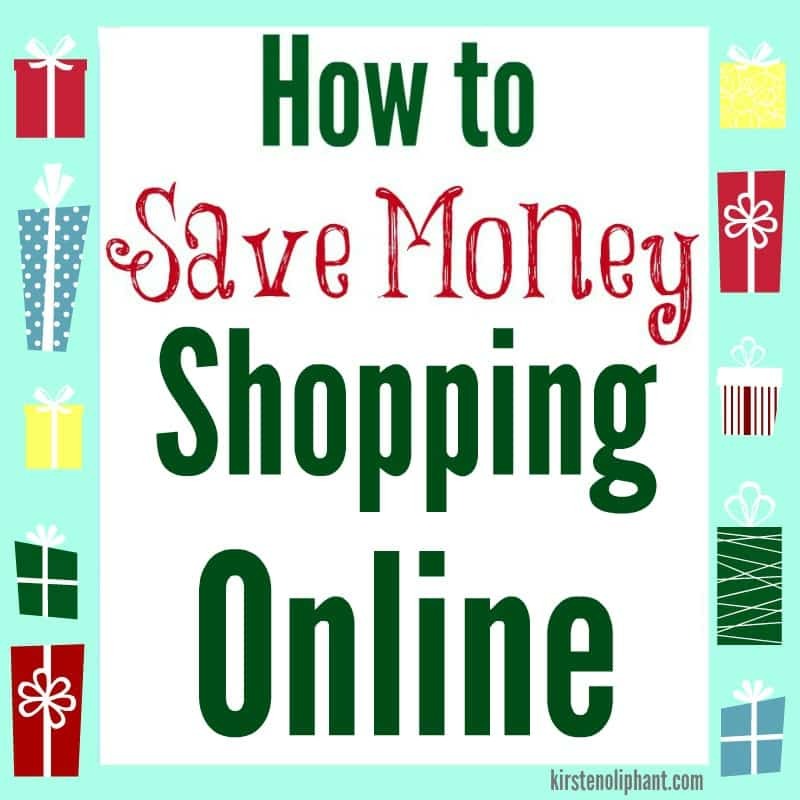 Now that we’ve got you giving responsibly, now let’s move on to how to save money shopping online! Swagbucks is basically a search engine that randomly awards points for searching for things. I’ve used it for a few years now and gotten tons of gift certificates, usually to Amazon. Keep in mind that it’s not the BEST search engine. Generally, I stay logged in and added their search toolbar. Then, instead of typing in the address to my commonly visited sites (like my email, social media, etc), I just type that into the Swagbucks toolbar. I also will sometimes just sit and type in search terms while watching movies. You don’t always win, but usually win at least a few points a day. You can also take surveys, enter contests, watch videos or more to earn points—do as much or as little as you want! If you refer friends, you can also earn points. It’s simple to use and you can earn big by using it daily for things you already do. Ebates is fabulous for getting money back just for buying things you were already going to buy. I usually get a few hundred dollars a year just shopping through Ebates. How it works is simple! 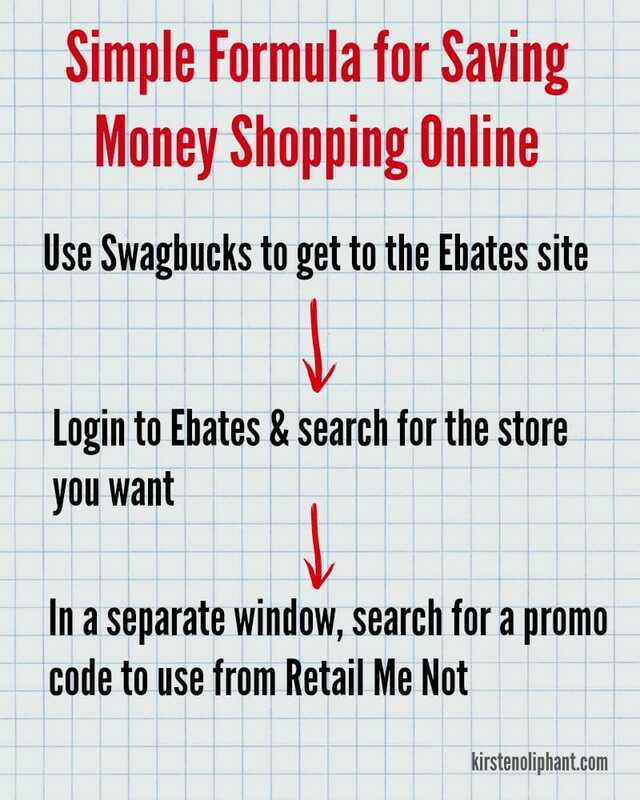 Navigate to the Ebates site (using the Swagbucks search bar to maximize earnings!) and then type in the store you want in the Ebates search bar. You will see how much cash back you get that day. (It changes daily so sign up for their email to find out what the best deals are for the day & week!) Click through to that store and you will be redirected to that site. It will look TOTALLY NORMAL. Shop and buy what you want while still in that window that you reached via Ebates. After purchase, cash back will be added to your Ebates account. BOOM. Like Swagbucks, you can earn for referring people as well, so definitely take advantage of that and tell your friends if you like it! Find Coupon Codes on Retail Me Not. I love Retail Me Not because almost every store you can think of is there, from Papa Johns to Coach. Search for the store, then check what coupon codes are available. Some are the advertised store sales and some are unadvertised codes that might or might now work. There is a rating meter that shows how successful people found the code. You can sometimes find some GREAT deals this way. Follow Coupon Bloggers for Amazing Deal Updates. I follow a few coupon bloggers and look for their updates especially during the holiday sale season. Having someone else do the work of finding the rock-bottom deals for you means the less time YOU spend trying to find them. My favorite is Couponing 101, which is a no-nonsense, up-tempo blog that shares practical savings. You can also find great recipe ideas and ways to keep your house full of great, CLEAN foods at Real Food Enthusiast, by the same blogger Stephanie Rector. Often there are MANY deals during the holiday season, so sign up to be notified of new posts by email. If you are already using a site to shop and love it, many of them let you recommend friends for a referral bonus! I love using Amazon to shop, and if you like something share it on Facebook, Twitter, or your blog! If you sign up as an affiliate, you will have a little task bar at the top as you shop so you can link to that page using your affiliate code. Sites like Zulily, Joss & Main, and One Kings Lane also have affiliate programs and will usually reward you if someone buys something. You don’t have to be weird or intrusive with these—just share if you found something you like or see something you think someone else would enjoy! But ALWAYS let people know that it’s an affiliate or referral link, just to keep things on the up and up. (Ps- If I’m mentioning an affiliate program in this post, that is a program I use and that’s MY affiliate link.) And sometimes the affiliate programs give back! If you get someone to sign up for Living Social, you get $10 to spend toward a purchase and so does the person who signs up! Win, win. Often with sites like Groupon, Moolala, and Living Social, there are savings and then there are EXTRA savings. With each of those, I get an almost weekly email that I can take an extra 10-30% off the already discounted price. If you see a deal you like, make sure you note when the sale ends and then wait to see if there is an extra percentage off before you buy. If not and you still want it, buy it! But if you wait, you may get an extra good deal. I hope these tips are helpful! I would rather sit at home and purchase gifts online than have to fight crowds in the stores. What tips do you have for saving money online? This post is chock full of referral or affiliate links! That simply means that I get a referral bonus in money or in credit for telling you about the site/product. Thanks for supporting me and my blog with your clicks. I don’t recommend things that I don’t like or don’t use!! « The Best Green Cleaning Products PLUS How to Use Them!